Artist Jean Graham was honored by the Bank of America as a “Local Hero” during the bank’s Neighborhood Excellence Initiative Awards held November 16 in Austin. Jean is the artist behind Brentwood and Crestview’s Wall of Welcome and the inspiration for several Violet Crown projects and events. Jean’s $5,000 award will be given to Violet Crown Community Works (VCCW), the non-profit organization initially formed to support the Wall of Welcome project. With the Wall of Welcome nearly completed, VCCW has broadened its scope to include other neighborhood enhancement and community building projects for the Crestview and Brentwood community. 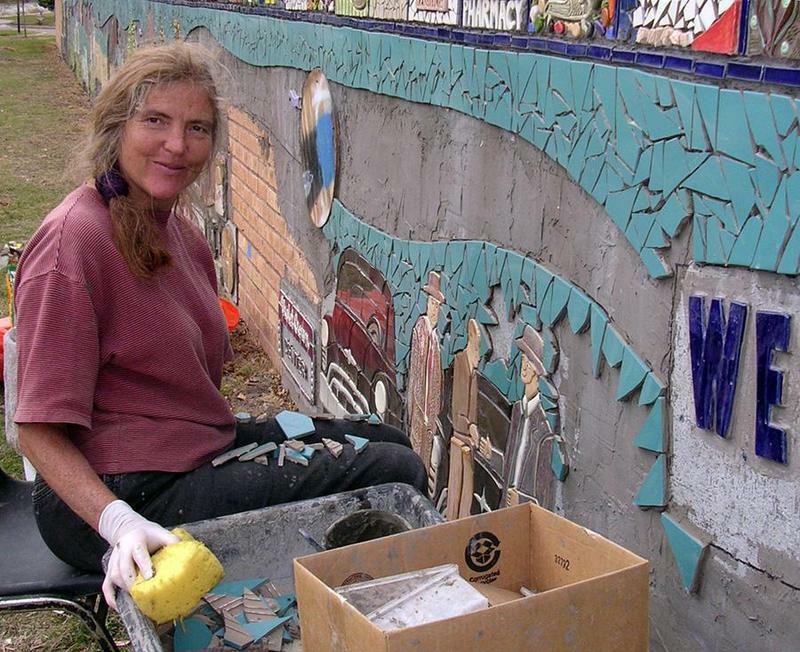 Jean first presented the Wall of Welcome design to community residents in late 2002; the proposed project served as the inspiration for the inaugural Violet Crown Festival, held each May since 2003. Proceeds of the first four festivals helped fund the Wall of Welcome. Planning is underway for the fifth annual festival next spring. violet crowns and marched in the parade, led by a 10-foot-long Domino the Pig puppet Jean created. Installation of the Wall of Welcome, which began in the spring, is almost complete. The wall, at Crestview Shopping Center on Woodrow Avenue, features landmarks and historical scenes from Brentwood and Crestview; it also incorporates personalized tiles created by neighborhood residents, churches, and businesses. Thanks, Jean, for all your contributions to our neighborhood’s creativity and community spirit! I’m so glad for this recognition. I’ve been noticing the recent hours spent recently on that wall and have been secretly waiting for it to finish so I can admire it up close and take some pictures. It’s nice to have a name, too. Great work, Jean!